“I just don’t know how you’re going to put all this into words,” muses Alan Grant, Skibo Castle’s affable host. We’re in philanthropist Andrew Carnegie’s grand dining hall for a hosted dinner party, where members of the club don their glad rags (or kilts) and sit down to a sumptuous farm-to-table meal. There’s an unbelievable atmosphere created by a group of people who feel more like family than members of a prestigious club. The presence of the Carnegies is felt throughout the evening and throughout my stay—steel magnate Andrew Carnegie was born in a one-room cottage and later emigrated to the US in search of a better life, where he became one of the richest businessmen in the world. 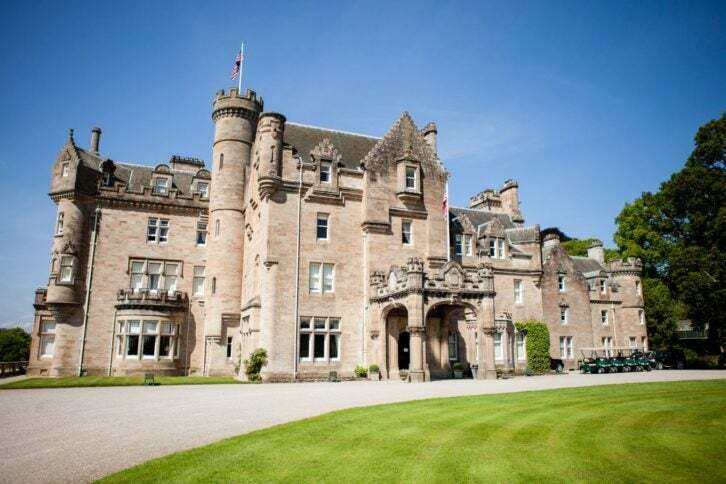 Returning to Scotland after the birth of his daughter, Margaret (whose kitsch room I stay in), he fell in love with Skibo Castle, and King Edward VII, Winston Churchill and the Rockefellers were among the guests who joined in the remarkable dinner parties held here. Following the dinner, there’s the ceilidh (pronounced kay-lee). The high-energy moves are not for the faint-hearted, or those whose legs are a wee bit sore from horse riding through the woodlands earlier in the day. Loosely translated from Gaelic-Norse, skibo means ‘enchanted place’ and it couldn’t be more fitting. The castle is set among an astounding 8,000 acres of lush greenery, sparkling lochs, pristine gardens and moorlands. The best way to explore is on horseback or quad bike, or by the chauffeur-driven Land Rovers that appear out of nowhere—magically materializing to rescue you if you happen to make an ill-advised decision to walk through the estate and are caught in a torrential downpour of rain. However, as I’m told many times throughout my stay, if you don’t like the weather, just wait five minutes and sure enough you’ll be rewarded with sunshine and blue skies. The castle provides welly boots and waxed jackets to protect you from the elements and the building itself stays toasty at all times—hardly surprising considering there are more fireplaces than bedrooms. Most of the activities are outdoors. The crisp air of the Highlands is a welcome antidote, especially if you’re a city dweller, and whatever the activity, all of the instructors are knowledgeable, incredibly friendly and infectiously passionate about the estate. They cater to all abilities, from beginner to advanced. Amanda, the horse riding instructor, has wonderful analogies to get you trotting on your gloriously-named horse, Thunder—“Hold the reins like they’re two glasses of wine”—and Mike, the shooting instructor, won’t rest until you hit the rapidly moving clay pigeons. Golf is one of the main attractions at Skibo—The Carnegie Links, an 18-hole championship course on the banks of the Dornoch Firth has seen its fair share of golfing royalty. Following a day of activities in the fresh air of the Highlands, the spa is a divine place to unwind. Try one of the signature treatments—‘namh air an talaimh’ meaning ‘heaven on earth’ provides exactly that. 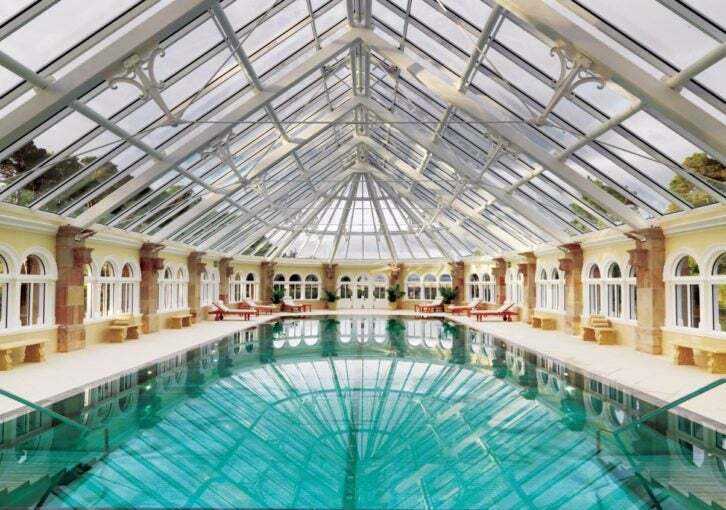 And the swimming pool is stunning. Set beneath a domed glass ceiling and looking out over a loch, it is incredibly peaceful and you’ll more than likely be the only person in there. Membership was closed for many years, having reached the restricted capacity, but is now re-opening for a limited period to replace the small number of members who have departed over the last decade. A true testament to members’ loyalty and the magical bubble that is Skibo Castle.